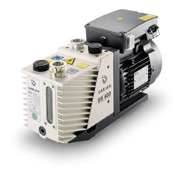 Designed and manufactured to meet the demanding requirements of various industrial and scientific applications, Varian's reliable Rotary Vane Pumps ensure high pumping stability for light gases, low noise, minimal oil backstreaming, and a long operating life. Varian has introduced the first rotary-vane pumps with truly "smart" capabilities, the HS 452 and HS 652. These pumps employ an innovative frequency converter technology that delivers optimal and consistent performance under any combination of input power voltage and frequency, worldwide. 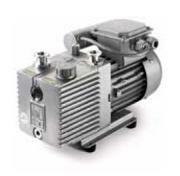 Varian's Rotary Vane Pumps conform with CE requirements, and all pump motors are UL and CSA approved. HS 452 "Smart" Pump 450 liters/min. HS 652 "Smart" Pump 650 liters/min. HS 452 “Smart” Pump 450 liters/min. Varian’s HS 452 pumps employ an innovative frequency inverter technology that delivers optimal and consistent performance while encompassing the worldwide range of voltage and frequency conditions. The microprocessor-controlled frequecy inverter, combined with a 3-phase motor, is an efficient driving unit, capable of delivering the high starting torque required of a dual-stage oil-sealed pump. HS 452 technology solves the common problems inherent in single-phase motors. These pumps start with inrush currents about 7 times lower than that of equivalent traditional pumps. Unlike traditional pumps, the software-driven startup procedure in the HS 452 will sense in seconds if the pump is faulty, thus avoiding uncontrolled load conditions. The result is very easy pump integration. The 3-phase inverter output is constant and independent of single-phase input frequencies and voltages. Motor efficiency and power factors remain optimal, and, as a result, the working temperatures of the motor and pump remain low and constant, wherever in the world they are being used. HS 452 pumps can be remotely controlled via discrete I/O or through RS-232/RS-485 interfaces. Varian’s T-plus Navigator Software facilitates this communication. Pump performance can be tailored for specific applications by setting the rotational speed through the software. The software also monitors and logs pump parameters, making it possible to perform diagnostics on the pump and the system. HS 652 “Smart” Pump 650 liters/min. 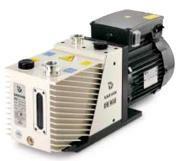 Varian’s HS 652 pumps employ an innovative frequency inverter technology that delivers optimal and consistent performance while encompassing the worldwide range of voltage and frequency conditions. 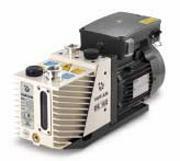 HS 652 technology solves the common problems inherent in single-phase motors. These pumps start with inrush currents about 7 times lower than that of equivalent traditional pumps. Unlike traditional pumps, the software-driven startup procedure in the HS 652 will sense in seconds if the pump is faulty, thus avoiding uncontrolled load conditions. The result is very easy pump integration. HS 652 pumps can be remotely controlled via discrete I/O or through RS-232/RS-485 interfaces. Varian’s T-plus Navigator Software facilitates this communication. Pump performance can be tailored for specific applications by setting the rotational speed through the software. The software also monitors and logs pump parameters, making it possible to perform diagnostics on the pump and the system. The oil mist eliminator and the exhaust filters retain the oil vapors which would otherwise be expelled into the atmosphere during pumpdown and gas ballast operation. Some models feature an oil return line to allow condensed oil or fluid to return to the pump reservoir. Varian's new traps are designed to prevent the backstreaming of mechanical pump fluids. Copper and stainless-steel gauze inserts are designed to reduce oil backstreaming.